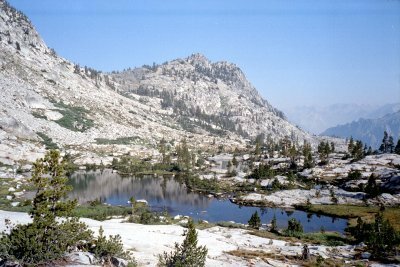 In 1990, I had hiked solo through Granite Basin, across Windy Ridge to Marion Peak, entered Upper Basin north of Vennacher Needle, and returned via Arrow Canyon. That trip was one of the most challenging and rewarding trips I have ever taken. 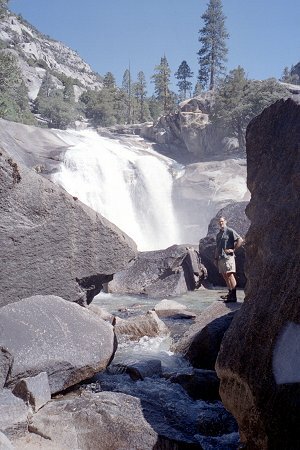 I wanted to visit some of the same territory with Roy and Michael, my hiking companions in 1998, as well as to explore some new areas. 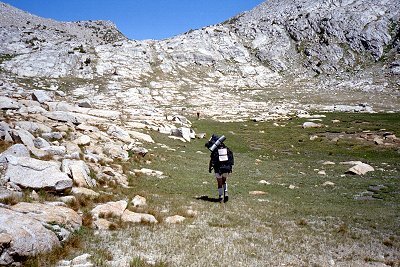 In 1990, the scariest parts (which I did not want to repeat) were descending into Upper Basin from Lakes Basin, and descending the lower part of Arrow Creek. 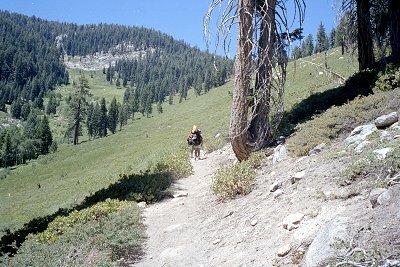 So I planned to go directly from Lakes Basin to the South Fork of the Kings via Cartridge Pass, where an old unmaintained trail promised easy passage. And I planned to bypass lower Arrow Canyon by climbing into Window Creek and descending that way. 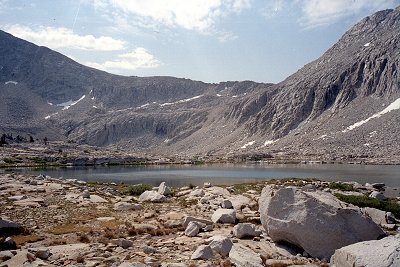 Finally, I wanted to bypass Granite Basin, instead going by way of Grouse Lake and Glacier Basin. In 1990, I started after Labor Day and had wonderful warm, dry weather and say almost no one. This year, circumstances dictated a date in late July through early August. Fortunately, the snow season was somewhat below normal and snowfields were never in our way. We got to see lots of wildflowers, which would be gone in another few weeks. And other than a few afternoon showers, we had mostly warm, dry weather. Overall, fate was on our side. 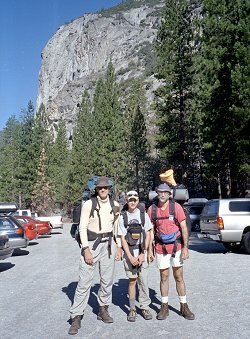 As in 1998, Roy and Michael were my hiking companions. Roy and I are two years older and slower, while for Michael the past two years has meant a big increase in strength and endurance. Just like last time, the baggage did not arrive with us, which delayed our departure from Fresno until after 5:00 PM. We didn't get in until after dark, which is just as well because we were forced to stay in one of the mega-campgrounds among the mobile homes, electric generators humming all night long. We were up and out before anyone else was stirring. Hardly anyone else had reserved a wilderness permit for Copper Creek -- I wonder why ? There was a new policy on bear canisters this year. In fact there were several. The regulations enclosed with the wilderness permit reservation were unclear, so I called the backcountry ranger for clarification. 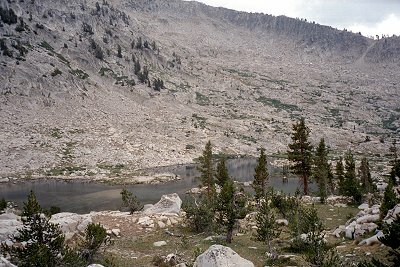 I talked to two rangers and got two different stories, but the guy in charge said we would not need to carry the canisters if we were not going through Rae Lakes (we were not). The ranger at the trailhead had another opinion, and insisted we needed to rent canisters if we were going to stay anywhere along the Rae Lakes Loop trail, including Paradise Valley. So we decided not to stay there. The first day's climb is 5000 feet, hot, and dry. This is what keeps most of the people away. We saw a couple people being ferried up on horseback, and passed one party on foot, but otherwise we had the trail to ourselves. We arrived at Grouse Lake late in the afternoon, ready for a relaxing meal and a good night's sleep. We had the lake all to ourselves. The weather was clear and warm, the mosquitoes minimal. Nothing could make it better. This photo shows the Grouse Lake Pass, our route for the next day. The next morning we got an early start, still somewhat on East Coast time. We admired the view as we ascended above Grouse Lake. 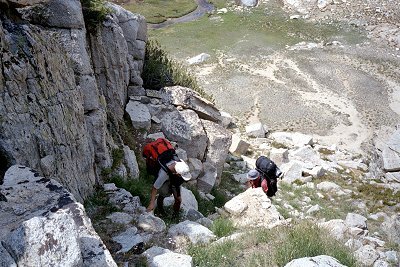 After a steep descent to another series of charming lakes, we began to ascend Goat Crest Saddle. If you look closely, you can just barely see Michael ahead, then Roy. I generally traveled a little slower, focusing on enjoying the journey rather than destination. 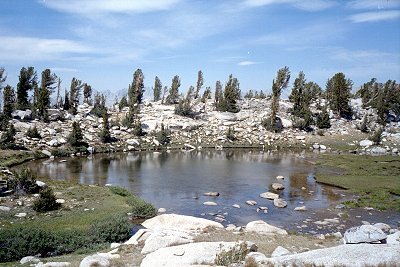 At the very top of Goat Crest Saddle we found a small lakelet and a little snow field. We got our first glimpse of the route to come, that would occupy us for the next few days. From the saddle, we got our first glimpse of the route to come, that would occupy us for the next few days. 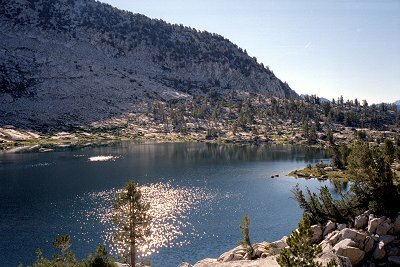 The sparsely wooded slopes beyond the lake hide the rest of the Glacier Lakes, State Lakes, and Horseshoe Lakes. 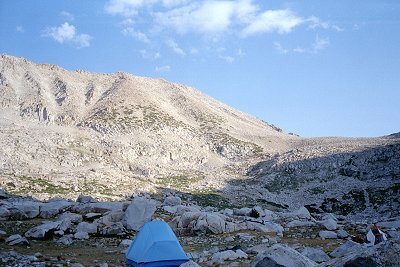 Beyond that, on the skyline, is Cirque Crest. Out route will take us past the lakes and high up along the far side of the crest. We decided to stop for the night at Lower Glacier Lake. Even though we did not travel very many miles, we climbed and descended two passes, each involving about 1000 feet of ascent. At this lake we met another party of hikers, the last we would see until the last day. We stopped and had a friendly chat with a man who was out hiking with his wife, two sons, and a daughter. 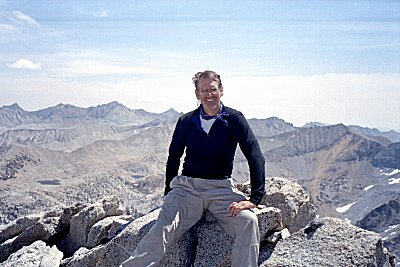 A former wilderness guide, he has been almost everywhere I have gone in the Sierras. He was quite incensed about the bear canister requirement -- he had changed his whole itinerary rather than rent canisters because he wanted to spend a night at Paradise Valley. We spent the night at the lower lake, enjoying its serenity. We had trouble finding suitable trees for hanging out food, and were a little worried because we had been warned that there was a bear in the vicinity. But nothing bothered us this night or any other. 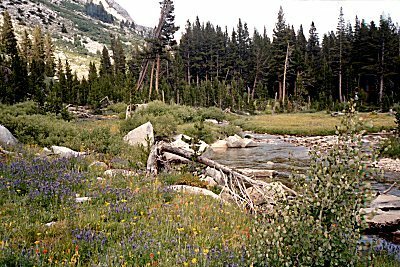 Below Glacier Lakes are two beautiful meadows. We had our most serious encounter with mosquitoes here, so we had to hurry past without getting to fully appreciate the scenery. 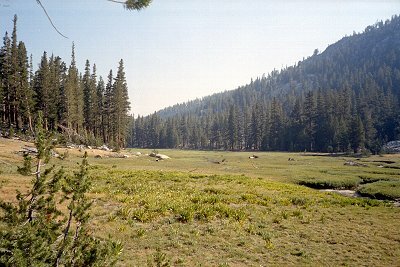 From the foot of these meadows we picked up the trail to State Lakes, where we had lunch. Then we headed toward Horseshoe Lakes. We had expected to have to cut cross-country, but to our surprise found a trail. Proceeding around Horseshoe Lakes, we climbed up Windy Ridge. We were aiming for Gray Pass, a point which cannot easily be identified by sight the direction we were travelling. We relied on our GPS to get us there, and discovered one of the drawbacks to this form of navigation. We wound up travelling almost the right course, only a few hundred feet too far east, but also a few hundred feet too high, and had to traverse some steep slopes and then drop down to the pass from above. Ten years ago I went by the shape of the terrain, and went directly to the pass. See my essay later on about GPS navigation. This picture was taken from Windy Ridge, looking down toward Gray Pass. 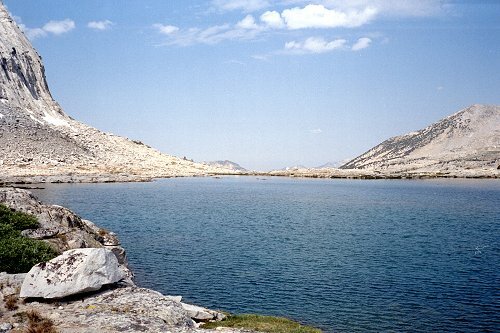 The lake is just to the east of Windy Ridge and north of Gray Pass. The mountains in the far distance are the Palisades. The east side of Gray Pass looked pretty steep. We kept to the right and followed a gully down to the South Fork of Cartridge Creek, where there are a series of lakes, where we camped for the night. This picture shows the pass and the lake that we camped by. We came pretty much directly from the pass to the lake, rather than descending directly to the creek. Our campsite in Cartridge Creek was idyllic, on a small ridge poised between several small lakes and on the lip of a steep canyon dropping off below. The views to the north were intriguing, mysterious. I have never been up in that territory, and I don't know the territory. Someday I must get up that way. My Whisperlight stove had been giving me trouble the whole trip -- it would light but would barely make any heat. My little wire unclogger broke the first time I tried to use it. Try as I might, I could not find anything (pine cone spike, stiff grass, etc) that was small enough to fit into the jet. Didn't the jet cleaning tool used to have a little folding sheath to protect it ? Not any more, and now I know how fragile that little piece of wire really is. At this point I finally gave up trying to cook with it and we all shared one stove. Thank goodness we had each brought our own cooking gear. 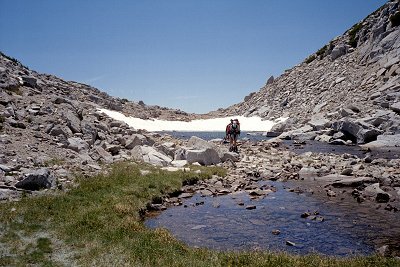 The next day we began by ascending Cartridge Creek to the next lake, then cutting left toward White Pass. Each time we ascended another ledge, the sensation of height became stronger. There was more and more below and less above. As we left the creek (left photo) and ascended the last little bit to White Pass I recognized the lake where I had spent the night ten years before. On that trip I had been able to climb Marion Peak and descend to Marion Lake in one long day. This year it was almost lunchtime, the clouds were building, and our energy was flagging, so I reluctantly put aside the idea of once again climbing Marion Peak. I promised myself that we would be sure to give Arrow Peak a serious try. On top of White Pass, it looks possible to follow the ridge right up to Marion Peak. It actually works for a while, but eventually the ridge gets narrow and has steep breaks in it. One look at the clouds confirmed that it was time to get lower down. From White Pass, the next step is Red Pass, named for its distinctive red rocks. It is somewhat lower than White Pass, and presents a choice that illustrates our different hiking styles. I dropped down from White Pass into the valley below, then hiked up past lakes and through meadows to the pass, which required me to climb a couple hundred feet of gentle slopes. Michael always wanted to get from one point to another in the most direct way, the one that involved the shortest distance and the least unnecessary ascent or descent. So he cut across the steep slopes above the valley, gradually coming down to the pass. This time I got there first, and my legs appreciated the break from rock hopping that I got by walking through the meadows. Descending From Red Pass toward Marion Lake was really steep, but a faint trail was visible off and on, giving us confidence that we were on the right track (and would not have to back up to found out way down). We finally reached the point pictured at the left, the only break the seemingly impassible cliffs surrounding Marion Lake. It looked doubtful that we could make it, but a faint trail leading down encouraged us to try. One problem with the route down the gully was that it looked impossibly steep, but halfway down it got steeper and we could not see if we could actually make it all the way or not. We made up our minds that we would try, but that we would go back up if the route got so steep that we were in danger of falling. As always, these descents are more dramatic before than after. Going up is physically demanding, but going down is mentally taxing. We made it to the bottom in no time, skirted around the edge of the lake, and made camp. There is a regular trail to Marion Lake (although we did not travel on it) so we expected that we might see other campers there. But no one else was around, and the usual signs of heavy use were absent. 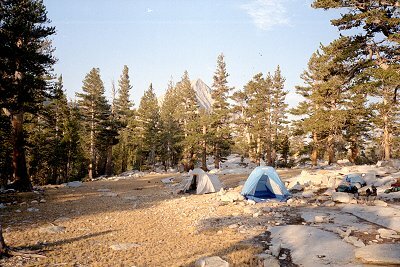 Although we were spending most of our days above the treeline, we camped below it, and always carefully hung our food. I was more worried about bears at Marion Lake than anywhere else, but thankfully nothing bothered us. The next day's route, through Lakes Basin, over Cartridge Pass, down to the Kings River, and back up again to Bench Lake was, in retrospect, too ambitious. We made it to Bench Lake, well before dinner time, but we did not have enough time to savor the pretty country that we passed through. 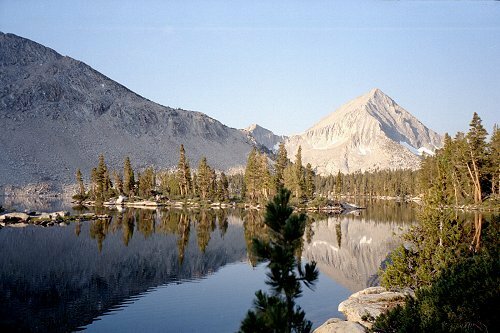 This pretty country began with Lakes Basin, a series lakes in a large, flat opening in the mountains. At the far end of the lake shown to the left is Cartridge Pass, which climbs up the slopes to the low point on the horizon. We found intermittent faint signs of a trail, leaving us to wonder whether we would have trouble on the steep climb to the pass. This shows the same lake as the picture above, from the foot of Cartridge Pass, looking the other way. I wished we had time to stop and take a dip by the lake, but we were anxious to get up the pass and over to the other side. So after a brief rest, we headed on. Right at the foot of the cliffs, the trail gets markedly better. 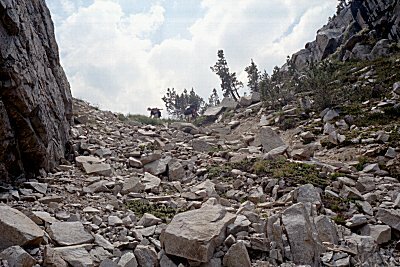 There are actually switchbacks left over from many years ago, when this was a maintained trail. These are washed out in a few spots, but for the most part we could follow the trail all the way up the the pass. 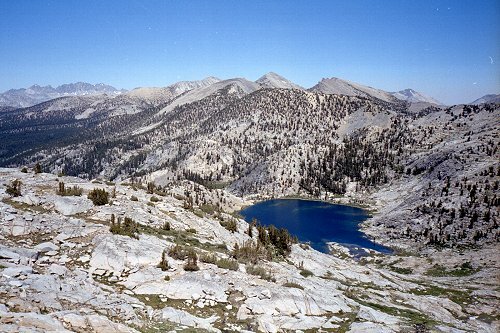 This shows the upper part of Lakes Basin from about half way up the pass. Note how the clouds have moved in, casting shadows over parts of the basin and the surrounding mountains. Compared to my route in 1990, over Vennacher Needle, Cartridge Pass was quick and easy. 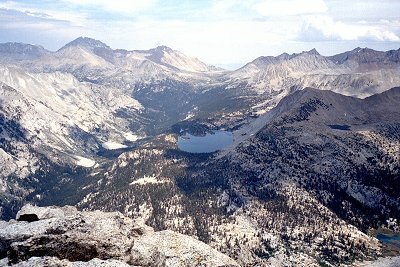 As a way to get to the John Muir Trail, I heartily recommend it. The south side of Cartridge Pass also had a relatively good trail, which made travelling much quicker. We passed this lake on the way down. Just beyond the lake, the valley drops steeply over 1000 feet, down to the Kings River. Bench Lake is just barely visible, across the canyon, beneath the pyramid shaped peak. After going straight down to the Kings, it was tempting to go right back up the opposite slope to Bench Lake. This is what I had tentatively planned to do, and what Michael wanted. I thought the slope looked awfully steep, and had a number of worrisome cliffs that might block our way. I finally realized that I was here to explore, not to get to Bench lake the shortest way. 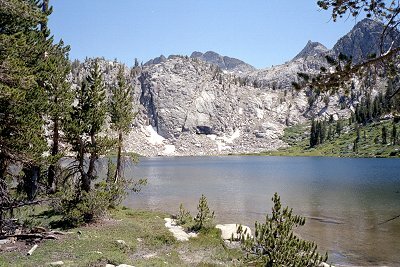 So I decided I would rather hike up the Kings River a couple miles, and then take the John Muir Trail up and over to Bench Lake. Michael and Roy reluctantly followed. As it turned out, the valley of the Kings River was filled with the most abundant wildflowers we encountered anywhere on our trip. I wish I know how to make a photo of a field of wildflowers turn out even one tenth as beautiful as the original. If you look closely, you can see blue, yellow, and red flowers. In the photo they look thin and scraggly, in person they looked like they covered everything. We hiked a couple of miles through these wildflower meadows. Again the GPS proved its use. I had a waypoint set at the junction of the river and the trail. 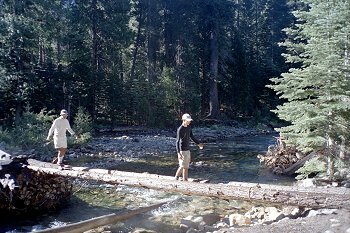 Although we couldn't really get lost hiking along the Kings River, and could not possibly miss crossing the John Muir Trail, we could follow our progress bit by bit as we approached the trail. Just as we drew within 100 feet of the waypoint, the trail appeared ! Exactly where it was supposed to be. Technology is pretty amazing, even if it is kind of useless most of the time. We hopped on the trail and hurried up to Bench Lake. Again we expected to see people on this segment of the trip, but there was no one in sight. We got to Bench Lake and were the only people there. Again we hung our food carefully, worried about bears in such a popular campground. Again no bears. The campsite on the ridge overlooking Bench Lake was the most picturesque of all the places we stayed. 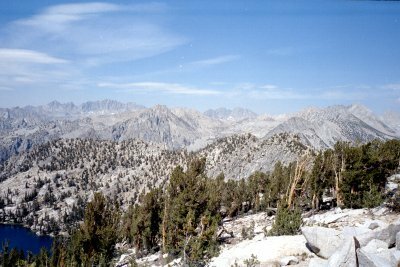 On the one side is the magnificent view of the Kings River, 1000 feet below, and of Cartridge Pass and Cirque Basin beyond. Looking down the canyon are the gigantic cliffs of Murro Blanco. 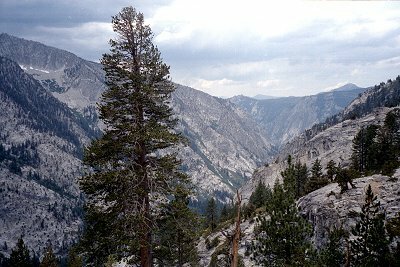 Looking up the canyon is the spacious Taboose Pass and the eastern spine of the Sierra Nevada mountains. 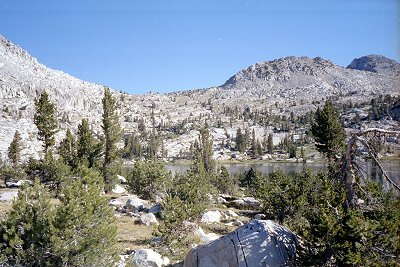 Looking the opposite way is Arrow Peak, dominating the skyline in its vicinity. But the best view of all was of the lake itself, ringed by trees on one side and by cliffs on the other, with its many wooded islands. Some kind of birds were making a ruckus all evening long on the other side of the lake, and the stars were magnificent overhead. Towering over the western skyline was our next objective, Arrow Peak. The route to Arrow Peak starts at the end of the trail at Bench Lake, proceeds around to the next watershed to the west, and crosses over a ridge of Arrow Peak at Arrow Pass. I would live to have time to explore this valley to the west of Bench Lake. 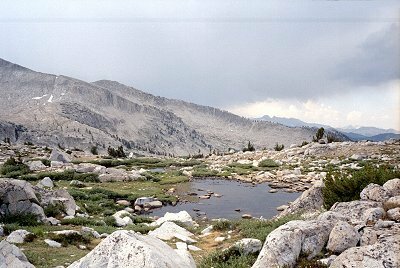 Next time, I would be tempted to descend the Kings River to the outlet stream, and climb up it to this valley (bypassing Bench Lake). It must have some unusual minerals in the water, because the water is an eerie blue color, and the rocks streamside appear to be covered with a white powder. I wonder if it comes from a prominent streak of red rocks high up at the head of the canyon. This shows the route up Arrow Pass: across the meadow, diagonally up, first to the left and then the right, roughly following the line of trees. We crossed at the lowest point (where a little snow is showing). Secor says to use the higher saddle to the right, but both of them work equally well. 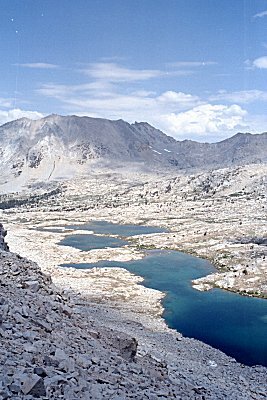 From the pass, it is a short descent to the highest lake in Arrow Canyon, a lake I call Upper Arrow Lake. This shows our campsite near the outlet of the lake, with Arrow Peak in the background on the left and Arrow Pass on the right. Every day there have been more clouds, building up earlier in the day. We have seen a few showers late in the afternoon, so we set the tents up as a precaution. Tomorrow we attempt to climb Arrow Peak, so we hope for good weather. On our ascent day, we started as early as we could rouse ourselves. The weather started out with ominous clouds in the west, which produced lots of rumbling thunder, but which seemed to stay put. As we neared the saddle of Arrow Pass, the clouds suddenly started moving toward us, the wind started blowing, and the rain started pelting us. For the first time in the trip, we pulled out our raingear and took cover. 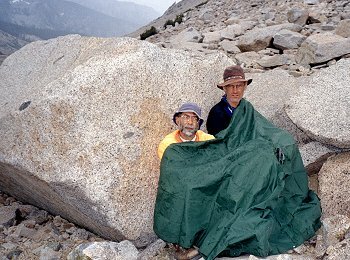 For a while, this rock sheltered us, but then the wind switched direction and the rain started blowing in our face. Hunkered down, under ponchos, we managed to stay reasonably dry through it all. From our vantage point on the side of Arrow Peak, we could see the progress of the storm. Successive waves of storm clouds came in from the west, passing over the mountains, and disappearing to the east. After an hour or so, we began to see blue sky to the west, although it was still raining on us. A little later, the rain slowed down, we resumed our ascent. It wasn't long before we reached the peak. By this time we had shed our raingear, the clouds were far in the distance and the sun was shining. 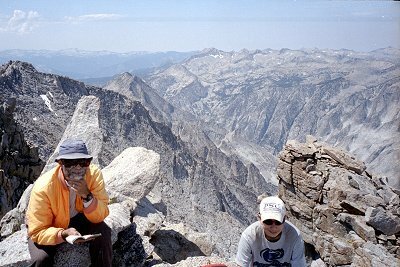 We perused the summit register, ate lunch, and lounged in the sun enjoying the view. Ours was were the third party this year. I was disappointed to find that the log book had been replaced since my last trip: I was looking forward to finding my own entry. From Arrow Peak we could see miles in every direction. Click on the image to see an interactive panorama. 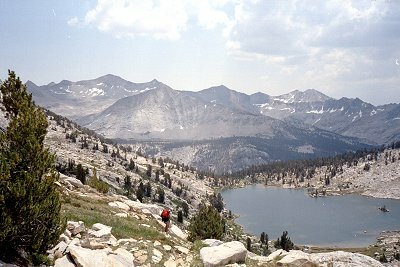 This shows Bench Lake in the center, with the South Fork of the Kings River to its left, Taboose Pass beyond, and the crest of the Sierras on the skyline. 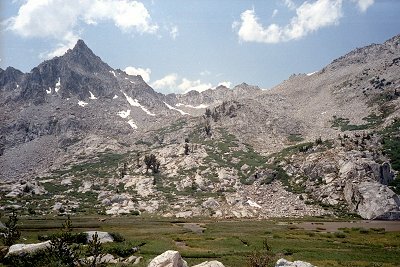 The Cartridge Pass trails reaches the Kings River on the far left, below the three prominent white spots (avalanche debris). We spent an hour or so taking in the views from the peak, basking in the sun, and enjoying the feeling of accomplishment of having reached the top. It wasn't long after we started down that we started hearing thunder, and noticed clouds approaching form the west again. We hurried down, hoping to at least reach the pass before the rain reached us. Again the clouds remained in place, seemingly over Paradise Valley, as we descended. The rain started falling on us minutes before we reached our campsite. We retreated to our tents for a nap while it rained. Our last goal was to get out of Arrow Canyon. The previous time I was here, I descended Arrow Creek to Paradise Valley. The lower part of this route was exceptionally steep, and I did not want to repeat that experience. Secor mentions an alternate route, which involves climbing over a spur of Pyramid Peak to Window Creek (not named on the map) and descending to Woods Creek that way. Again the weather threatened, brief periods of rain alternating with heavy clouds and thunder. We enjoyed descending the wide Arrow Canyon, studded with lakes and meadows. In Arrow Canyon, we never saw any evidence of anyone else's visit: no campsites, trails, even footprints. Such a beautiful valley. We were sorry when we finally had to climb the ridge and leave the canyon. Travelling through Window Canyon was more difficult than through Arrow Canyon. It was steeper, with increasing amounts of brush and trees as we descended. Arrow Canyon was broad and flat, whereas Window Canyon sloped steadily all the way to the creek. We continued steadily downward, toward the edge of Woods Creek. We had originally planned to camp on Window Creek, just before it begins its final, steep descent to Woods Creek. Indeed, there is a flat spot with easy access to the stream and a great view of the canyon below, which would make a great campsite. But we were getting anxious to return, and it was still early in the day, so we decided to descend further and camp as Paradise Valley that night. Although we were not carrying the required bear canisters, we had almost not food left, and hoped that we could store our trash in the bear boxes. We were happy to find a faint trail leading down into Woods Creek. It stays consistently east of Window Creek itself, staying off the steep slabs. As it gets closer to the bottom, it gets harder and harder to follow because it disappears more and more often into manzanita thickets. Eventually we just gave up trying to find the path, and fought our way down any way we could find. As we got closer to he bottom. the brush got thicker and thicker, as the slope gradually flattened out. It was quite a relief to step back on the trail. We suffered more cuts and scratches from this one descent than from the whole rest of the trip combined. A couple of miles on the Woods Creek trail brought us to Paradise Valley, where we met other hikers for the first time since Glacier Lakes. It was raining, so we hurried to put up our tents and get inside. There was only one other party present when we arrived, and another that got in shortly after us, so it seemed pretty quiet. The bear box there was large enough to sleep in, and was completely empty, so we had lots of space for our little bags of wrappers and trash. Although it rained intermittently all night, it cleared up at daybreak. We packed up out wet tents, clothing, and equipment and hurried off for home. With the exception of one couple who had been camped at Paradise Valley near us, it seemed that everyone else was heading up the canyon. We passed perhaps a dozen parties trudging up the trail. This was the only day where we would not have a significant amount of climbing to do. We stopped to rest and eat lunch at Mist Falls, before heading down the final stretch to Cedar Grove. As before, it was impossible to get a photo of the falls that accurately conveys its scale or feel. This picture makes it look little taller than me, whereas in reality if must be 30 or 40 feet. In the final mile, we passed through a charred section of forest, which had a strong odor of recent fire. We had noticed funny looking clouds near the beginning of the trip, and had smelled a faint fire odor, and had wondered if there were a fire burning somewhere in the park. Was this it ? Had the recent rains put it out ? We never found out. As we arrived back at the car, we were surprised to find the party who we had met at Glacier Lake. They had just arrived back at their car, parked next to ours, a few minutes before. 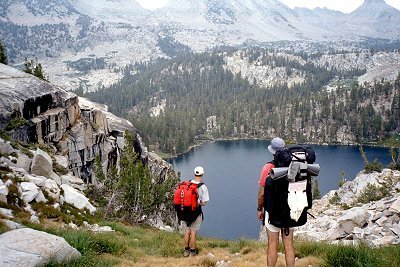 They returned via Copper Creek, after spending time near State Lakes, Horseshoe Lakes, and Granite Basin. We said goodbye again, only to meet up in Grant Grove one last time, later that day. This trip I brought along a GPS for the first time. I want to share some of my experience about using it for backcountry navigation. There has been a lot of discussion lately on rec.backcountry about the use of GPS for hiking, much of it obviously contributed by people talking from theory and not real experience. My first GPS was the cheapest, lightest model available, the eTrex. It is great at what it does: it is accurate, it stores extensive track logs, and it stores lots of waypoints that you can download from a computer. A GPS tells you where you are, which seems quite useful until you realize that you already know where you are -- right here. The GPS merely tells you a couple of numbers, which is not any more useful. What you actually need to know is how to get where you want to go, or at least where you are relative to some place else you can recognize. Because the eTrex., like most GPSs, does not know which way you are pointing it, it cannot tell you which way to go to get to some other place. Instead, you have to move a hundred feet or so, and see if that is a direction that will take you where you want to go. This is OK in theory, but if the terrain is steep, and you cannot move very fast, and if you cannot hold the GPS where it can get good reception while you are moving, then it is pretty difficult to navigate with only a GPS. What you need is a compass. Then you can use the GPS to determine a bearing from where you are to where you want to go, and then use the compass to follow that bearing. This sounds simple, but you have to figure out the bearing, correct for magnetic declination, transfer the bearing to the compass, and then follow the compass. Each time you get another reading from the GPS you have to repeat. It did not take me long to realize that a GPS with a built-in compass would be ten times as useful as two separate instruments. So when the eTrex. Summit, with a built-in compass and altimeter came out, I bought one immediately. Many people have failed to realize that the value of such an instrument is much more than the sum of a GPS and a compass, or have complained about the accuracy of the compass. I suspect they have never used a GPS. The altimeter in the eTrex. Summit, but the way, is worse than useless. The GPS can calculate altitude from the satellites, but it is about three times less accurate than the horizontal position. Thus the barometric altimeter. This is pretty accurate most of the time, but as the day progresses or the weather changes it gets less and less so. Furthermore, it sometimes is wildly inaccurate, off by thousands of feet. If I could, I would disable it and use the altitude measured by the GPS instead, but I have not figured out a way to do this. I carried the eTrex. Summit, and let Roy and Michael use the older eTrex. After the novelty wore off, the eTrex. migrated down to the bottom of their packs, and was not used. In fairness, navigation is often so easy that you don't need anything -- just follow the stream, head toward the pass, or pick any route toward a prominent landmark. What we actually used the GPS for, more than anything else, was to measure progress (not to figure out where to go). We could see how far we had progressed along a particular route by looking at the waypoints and the tracklog. This was mostly useful when we were hiking on trails, when you have time to think about such things. Off the trail, I am more focused on picking out a route to get around the next roadblock to think about when we are going to arrive. In my planning I did not realize this, and stored many waypoints along the off-trail parts of the trip, and none along the trails. I created waypoints for the trip using TOPO! software, and transferred them to the GPS through the data cable. I have heard of people plotting waypoints and entering the into the GPS as a set of numbers. These people tend to be the ones debating the relative merits of UTM versus DMS or D.DDDD or other representations of latitude and longitude. Personally, I don't want to deal with numbers when I am trying to navigate -- they are just too error prone. Another huge benefit of using the TOPO! software is that I could print the maps on which the waypoints were marked, so that I could correlate my position on the ground with the map with the GPS with certainty. 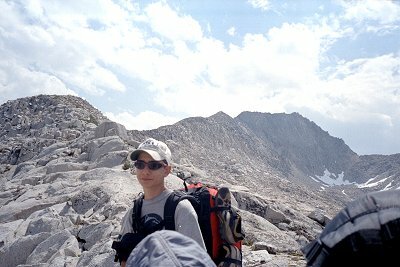 There are two mapping products that support the GPS and cover the Sierras: TOPO! and Terrain Navigator. They use the same underlying maps, which are supplies by the USGS. They provide roughly the same functionality, but differ in lots of details. In general I prefer Terrain Navigator, but they have a real problem when it comes to supporting new GPS units. It took them months before they could support the eTrex., long after several freeware programmers figured it out. As of this date (Aug 2000) they still do not support the eTrex. Summit. Their excuse: they are waiting for Garmin to send them full specs and a test unit. All I can say is that TOPO! worked right away with the Summit, even though it was written well before that unit came out. I wish Maptech (makers of Terrain Navigator) cared about their customers, was more competent in implementing GPS drivers, and was honest when things do not work. With TOPO! you pay extra for GPS capability; with Terrain Navigator it is free. Maybe thes is why one works and the other does not. One difference between the eTrex. and the eTrex. Summit is that the standard unit only supports one route, while the Summit supports twenty. Actually, the early Summit unit that I purchased only supported one route, but a firmware upgrade prior to my departure provided the additional routes. This upgrade let to speculation that a similar upgrade would be made to the regular eTrex. I am guessing that such an upgrade would be simple for Garmin to make. When I checked it out with their technical support people, they denied that there was any such plan, saying that the additional routes were reserved for their more expensive unit. (Don't you hate that ?) Anyway, I want to report that having only one route is not all that inconvenient. If you put in all the waypoints you will need, and if you you use a reasonable naming convention for them, then setting up the route for a day's hiking can be done in a minute or two. It is much easier and less error prone than putting in waypoints by entering their coordinates. So doing multiple routes is handy but not essential on a GPS.